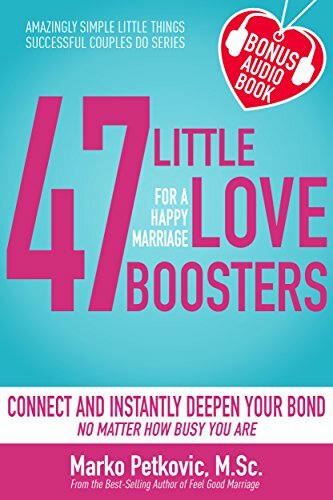 This is an interesting book that presents practical techniques to enhance a couple’s love life. In the modern world filled with non-stop activity, couples often neglect to build and maintain their personal relationship. The author admits that he was close to divorce before realizing a turn around was needed. Petkovic urges the reader to commit to doing something nice for a spouse or partner for the next ten days and to set a reminder to make sure not to forget. It is important to notice what makes a partner happy and to persist in doing those things while constantly adding new ones. The author briefly explains five little love rituals that involve simple actions like keeping up with your partner’s life and interests as they evolve, spending meaningful time together and reconnecting by simple gestures like an unexpected hug or saying thank you. Readers need to ask, “What can I do to make my partner happy?” It is in giving love, that we receive greater rewards. Petkovic urges his readers to download his cheat sheet and to subscribe to his list for additional suggestions. While these reminders and techniques will not work for everyone, the general advice is a good reminder that a relationship ignored will not thrive and that partners need to nurture one if it is to remain strong.